The Omni badge can only be unlocked once you reach Global Icon for every weapon category in Bullet Force. Every time that you rank up a badge, you get a free weapon case that will reward a skin for any gun - not just for the badge's category. If you leave a match prematurely, the kills you get during the match will not count towards badges. Getting kills within locked private matches do not count towards badges. Kill assists and Assist counts as kills do not count towards badge progression. When you reach Global Icon for a weapon category, you will automatically unlock the exclusive Royalty skin for every gun in that category. Your publicly displayed Region on the Weapon Rank leaderboard is based on your amount of kills. Regions are decided when you accumulate at least 70% of your kills in a particular region. PLEASE READ Follow the link below to contact customer support if you have lost any progression in BF. Hello loyal soldiers of Bullet Force. In the latest update, some of you have lost significant amounts of progress and items. All of your requests to get your weapons/perks/currency restored must be done through the official Bullet Force support website located at https://blayzegames.com/support/. Also note that this problem is widespread, so please remain patient. The small support team is in constant work to get everyone's accounts restored. While it isn't exactly known how long the wait might take, I'd personally expect anywhere between a couple of days to half of a week for a response from customer support to get back, but the wait could be longer. Regarding the new badges system, progression towards unlocking badges as well as the badges themselves are currently paused at this current circumstance so that they can be reset and so all of the players can start from a fresh slate. Your local player stats (nukes, K/D ratio, wins) will very likely not be affected. On behalf of Bullet Force, sorry for the lack of communication. There is very little I as a forum moderator can do alone, but I will continue to help as much as I can until all of the bugs and issues are fixed. Calling upon all content creators, artists and graphic designers of Bullet Force! Are you a Redditor that plays Bullet Force that want to be a member of loving, wholesome gaming community? Well look no further than joining the official Bullet Force subreddit! We are currently holding a contest to redesign the site's banner. We need more contest participants! Rules are listed at the bottom of this announcement in quote form. The winner will have their banner set as the official subreddit banner. The contest ends on Christmas Day (December 25th)! 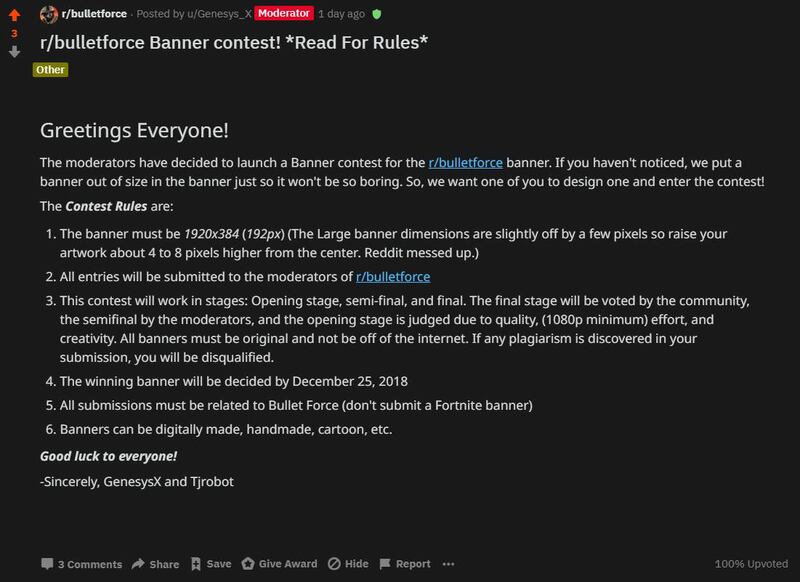 The moderators have decided to launch a Banner contest for the r/bulletforce banner. If you haven't noticed, we put a banner out of size in the banner just so it won't be so boring. So, we want one of you to design one and enter the contest! Blayze Games has announced the employment of a new developer at Blayze Games: Coolmark. Coolmark was a former player of Modern Combat 4: Zero Hour and Modern Combat 5: Blackout, who found Bullet Force during its 2016 open beta test. His past videos have contributed significantly to the growth of his YouTube channel and the game. Coolmark is now Blayze Games' community relations specialist. His job is to gather feedback from the game's playerbase by holding community livestreams every Friday and Sunday in addition to special events. Livestreams are currently planned to be held twice a week on Friday, 6:00PM PST and Sunday, 12:00PM PST. Blayze Games' CEO Clint Wilde has Tweeted out a new preview of the Dam map, showcasing the terrain, a vantage point, and the dam on the top right. Prepare for the gloomiest counter-terrorist operations this month! Defuse those pumpkins! Let us know what you think about these skins! - Nerfed AUG - range has been reduced. Rate of fire reduced to 740RPM. Blayze Games wants players’ voices heard about any additional issues and any suggestions to improve Bullet Force. Galaxy Raiders’ developer Joshua Wilde has once again found time to develop upcoming outer-space MMO Galaxy Raiders after the start of the school year. Exploring planets’ surfaces has been confirmed for the next major update. The Galaxy Raiders Twitter account has posted multiple video previews of what is to be expected in the next update. The preview videos demonstrate fortification building, digging planets, and using grenades to dig deep, square-shaped holes. We present you the copyright strike statistics for weeks 3 and 4! Copyright strikes have been filed against 210 additional Bullet Force videos that have been found to promote hacking and/or account sharing. This figure includes 70 videos from week 3 and 140 videos from week 4. Far fewer videos of Forward Assault have been struck recently, but the main targets of these strikes are the latest APK for the 1.1020 update. Additionally, Forward Assault aims to further improve its anti-cheat system in future updates. Destined 2 Rise (D2R), the most renowned clan in the competitive Forward Assault community, has won the first Mobile eSports tournament for Forward Assault! GeneralAlex unveils two new Forward Assault skins for the Hatchet: Lexus and Retro! The Community Skin Contest is well under way! 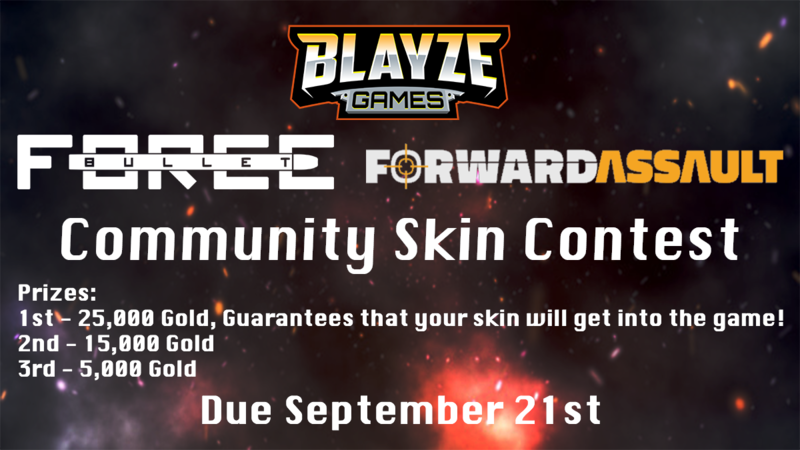 Blayze Games developer Alexkazam announced yesterday that Bullet Force and Forward Assault will be hosting a skin contest. This contest will put the community's most talented graphic designers head-to-head, with the top three winners being rewarded enormous hordes of gold, with first place getting their skin added to the game(s). Consolation prizes may be given to exceptionally good designers. New entries will close on the 21st of September. Rules, resources and upload areas are available in the link below. In other news, HiT announced on his Twitter that the Shorty SG will be NERFED! Rejoice, hooray, huzzah! HIT said: "There’s no way in heck a person should be able to kill me halfway across the map in one shot with a shotgun like it’s a sniper rifle and it’s not even a headshot. 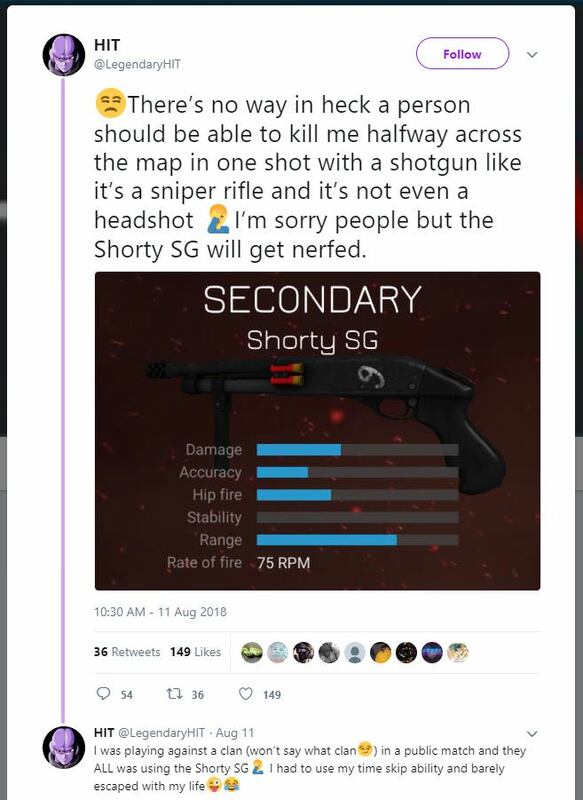 I’m sorry people but the Shorty SG will get nerfed." Bullet Force 1.42 Update Released! Blayze Games delivers its first update focusing on patching bugs and glitches in accordance with the consensus of the players. Blayze Games encourages its players to keep reporting as many bugs as they can find, so that they can be patched in upcoming updates. Blayze Games has filed copyright strikes against 359 videos as of week 3. This figure includes 285 Bullet Force hacking/account sharing videos and 74 Forward Assault videos of the same kind.